I love a slushy drink, like a blended margarita or a julep. They are so festive and vacationy and they have just a hint of childish nostalgia for slurpees. But I always feel like they are a bit too much bother with all that blending, and I get anxious that I won’t get the slushy texture right. This one comes together with a perfect slushiness and the tart grapefruit goes wonderfully with herbaceous gin. Make sure to peel the grapefruit really well, otherwise you will be chewing on a lot of roughage with your cocktail. Peel grapefruit, removing as much with pith as possible. Roughly chop and freeze in a zip-top bag until frozen solid. Combine sorbet, frozen grapefruit and gin in a blender or food processor. Blend until smooth. Serves 4. I hate maraschino cherries. They are too sweet and rubbery and I can't understand why anyone would ever use them as a cocktail garnish. I recently found a way better cherry garnish: sour cherries in light syrup. They come in a jar and they don't have a very sweet syrup, so the cherries retain some tartness and still taste like actually cherries, instead of nasty, gummy sugar balls. I have also used them in pies and as a cake filling, mixed with some other fresh fruit and they are always delicious. In these cocktails, I used the juice the cherries are packed in, as well as the cherries for garnish. The tartness from the cherries and lemon is perfect against the near cloying sweetness of amaretto. Excellent for a festive cocktail party or for ringing in the new year. You can easily multiply the recipe to make a pitcher for a bigger crowd (or a thirstier crowd). 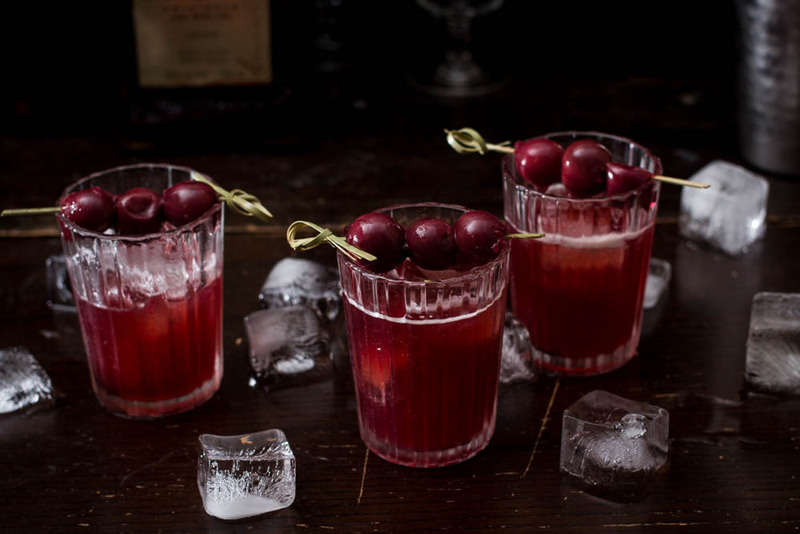 Shake everything but the cherries in a cocktail shaker with ice and pour into four glasses with an ice cube in each. Garnish with a skewer of cherries. I get nervous around those big stemmed margarita glasses. They are awkward and top heavy. I can barely drink a cup of tea, stone cold sober, without spilling a generous amount all over myself. I don't own much white clothing. Add tequila and (ideally) some drowsy, sunny catnapping and a heavy, tippy glass into this equation and I am invariably going to make a mess. It's not a super dignified look. Obviously, you should serve these margaritas however you like, but I think they are best in a sturdy and unprecious tumbler. No unnecessary stemware stress. This pineapple margarita is summer in a glass. Tart and sweet sunny yellow pineapple, acid lime juice with just enough sugar to take the edge off the pucker, with tequila and chili for bite. Tajin is a delicious Mexican spice blend with chili, salt and lime. It's really good sprinkled on sliced cucumbers, pineapples, mangoes...pretty much any kind of fruit. It's quite sour so if you do use it for the rims, so be judicious at first. Run a wedge of lime around the rims of four glasses and then dip them into a shallow dish of tajin spice or salt. In a blender, combine pineapple, ice tequila, triple sec, lime juice, chili and sugar and blend until smooth. Taste and adjust sugar, lime juice and tequila to your desired levels of sweetness/tartness/booziness. Drink in a hammock, if you are particularly confident about your ability to not spill. Sometimes in my head, I imagine a great thing that I'm sure I can do in the real world and it's definitely going to work out, no problem! And sometimes these imaginings do work out pretty well, and sometimes they are huge disasters. I did this last week. I had been turning around the idea of a preserved lemon cocktail in my head for a while and it sounded great. I was a bit worried about saltiness, but I figured I would soak the lemons and reduce the salt. Then I would turn them into a syrup that was sweet and just faintly salty and with that great, perfumed lemon-but-also-not-quite-lemon preserved lemon flavour. My dream cocktail was amazing. I would add basil and make an excellent, uniquely sweet and savoury, fragrant, sophisticated summer lemonade cocktail delight. This was hubris my friends. I sliced the preserved lemon into thin wedges, rinsed and soaked it to reduce the salt, and made a simple syrup, totally certain of my true cocktail genius. And then I tasted the revoltingly salty (Duh, right?) yet somehow too sweet syrup. I added lemon juice and more sugar, to try to balance out or at least distract from the off-putting qualities of my concoction. I continued to throw good sugar after bad for quite a while, never really improving things. I wound up with a super thick, still gross, lemon sludge. I put it in the fridge, thinking I could find a way to save it. Then I stared at it every time I opened the fridge for 3 days until I had to face reality and throw it away. I had already bought basil though, and I wasn't going to let this gross lemon-tastrophy ruin my basil cocktail dreams. For the next round, I went with a surefire flavour combo, with no daring acrobatics involved: basil, lime and gin. Sweet, tart, summery. All the childish, summer-time fun of limeade combined with all the fun of gin! For the grown-up kiddo in you. For now I will keep my preserved lemons for rubbing on chickens and turning into salad dressings. Until another wave of hubris hits me and I turn them into some kind of horrifying meringue. Combine ingredients in a small saucepan and bring to a boil until sugar is dissolved.. Reduce heat, and simmer on low about 5 minutes. Crush basil leaves in a cocktail shaker with a muddler or the end of a wooden spoon. Add all other ingredients and shake vigorously until the shaker frosts over and gets very cold. Strain into a glass and garnish with a stem of basil. Makes one, multiply ingredients by the number of gimlet drinkers.